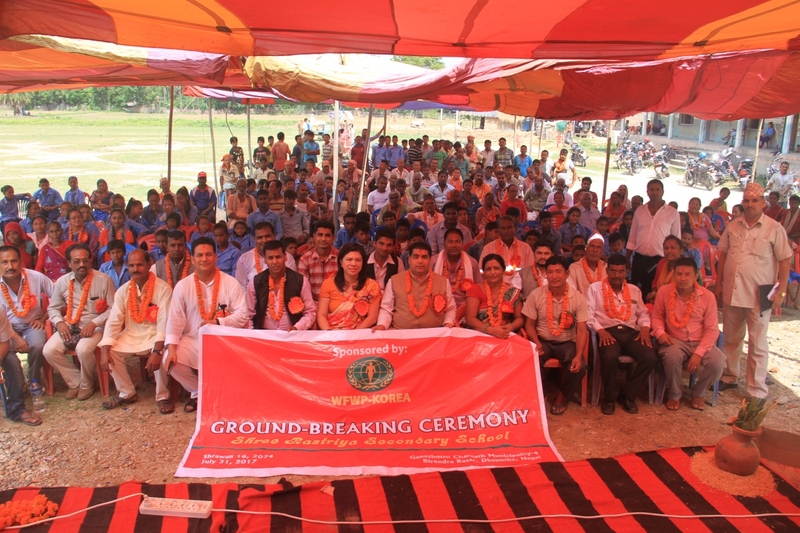 On July 31, 2017 WFWP-Nepal successfully organized a Ground-breaking ceremony in Shree Rastriya Secondary School, Birendra Bazar, Dhanusha District, which was sponsored by WFWP-Korea and Tongil group. It was presided by Hon. 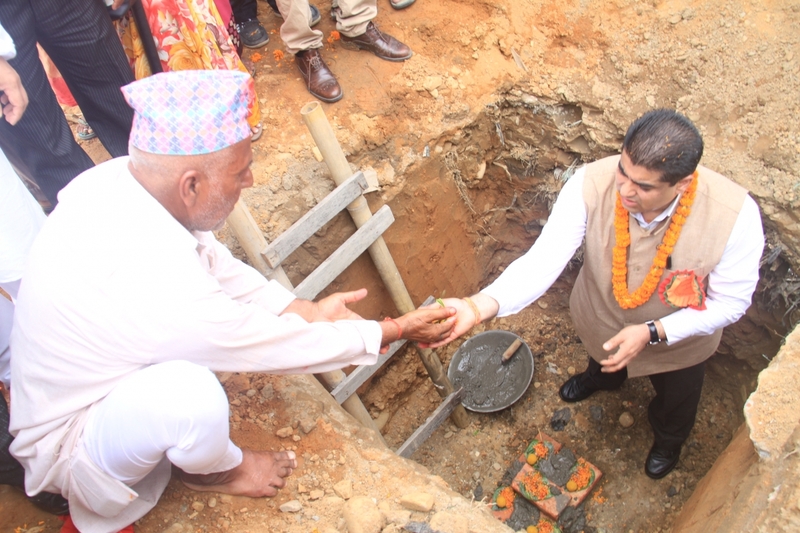 Ek Nath Dhakal, parliamentarian member and a former minister Cooperatives and Poverty Alleviation & Peace & Reconstruction, government of Nepal, along with Ms. Blessie Dhakal, President of WFWP-Nepal & Mr. Santosh Paudel, President of FFWPU. 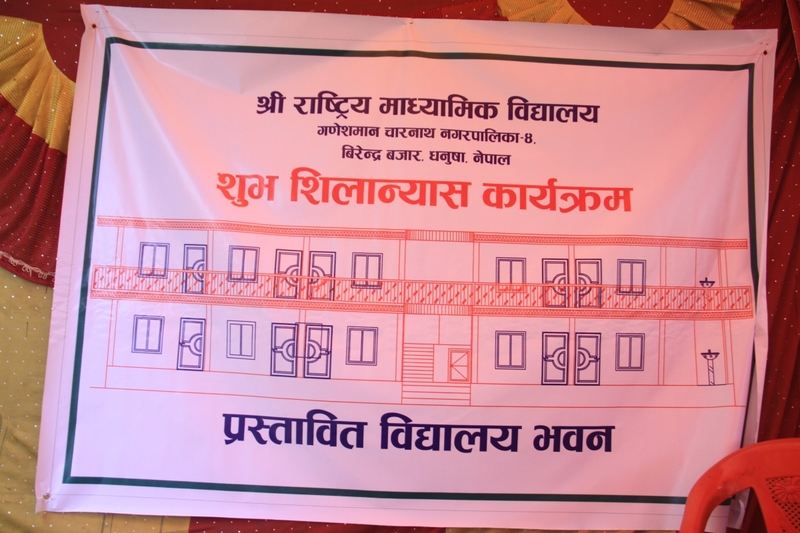 A total of 800 students will benefit directly in this school project. 2017년 7월 31일 네팔 여성연합에서는 한국여성연합과 통일그룹의 후원을 받아 다우누샤 지역 비렌드라 바자르에 위치한 시리 라스트리야 중등학교 기공식이 성공적으로 이루어졌다. 의회의원 겸 전 네팔 빈곤완화, 평화, 재건 장관인 에크낫 다칼, 네팔 여성연합 회장 블레씨 다칼, 가정연합 회장인 산토시 파우델씨가 주재했다. 총 800명의 학생이 이 학교 프로젝트에서 직접적으로 혜택을 받을 것이다. 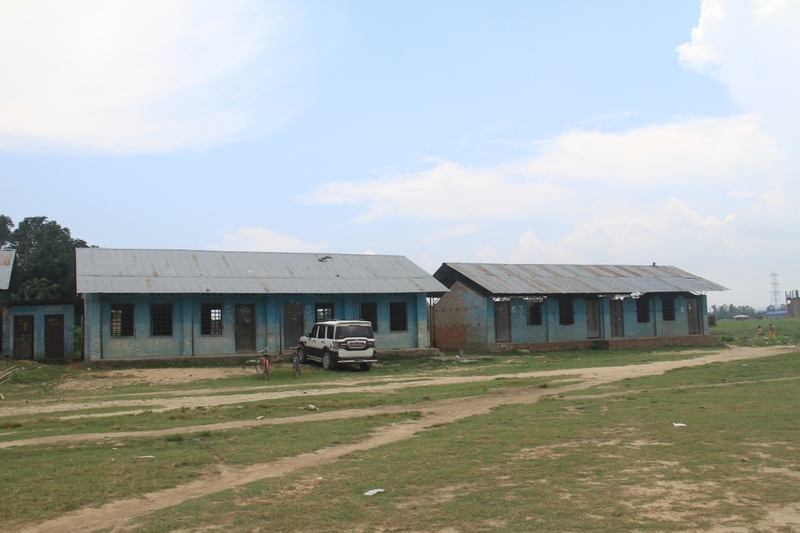 Earlier, the school management had applied to the Ministry of Education to upgrade the level of school by adding 11 & 12 class but the government rejected it because of no facilities but now after the new school building will be built they can be qualified. Therefore, it is the biggest hope of the students and the local community that they will be having a good school/establishment in their district. 앞서 학교 경영진은 교육부에 11반과 12반을 더해 학교 수준 향상을 위해 지원요청했으나 시설물이 없기 때문에 정부가 거절했다, 그러나 지금은 새 학교 건물이 지어진 뒤에 허가를 받을 수 있을 것이다. 따라서, 학생들과 지역사회의 가장 큰 희망은 그들 지역에 좋은 학교 기관을 가질 수 있을 것이라는 것이다. The program started with warm welcome presided by Mr. Hira Lal Shah, school principal. Individually, he introduced everyone namely; the Chief Guest, Hon. 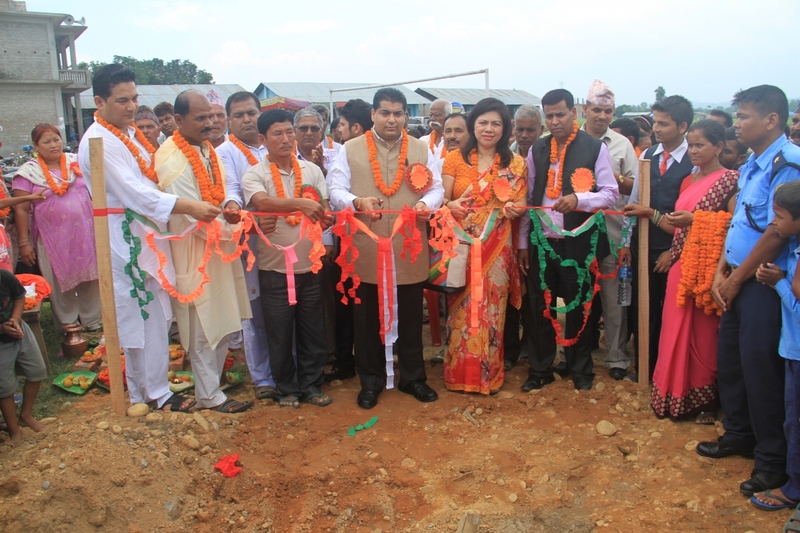 Ek Nath Dhakal, Mrs. Blessie Dhakal, President WFWP-Nepal, Mr. Santosh Paudel, President FFWPU and Mr. Hem Bahadur Thapa, School Management Committee. Afterwards the team went to the Ground-breaking spot to start the ceremony. 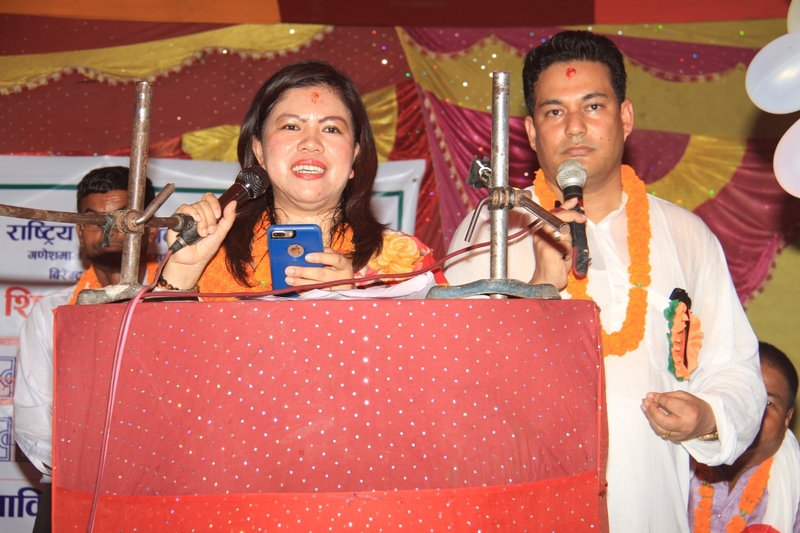 Later, Mr. Santosh Paudel, gave his special remarks followed by Ground-breaking remarks of Ms. Blessie Dhakal, and remarkable Chief Guest remarks conveyed by Hon. Ek Nath Dhakal. 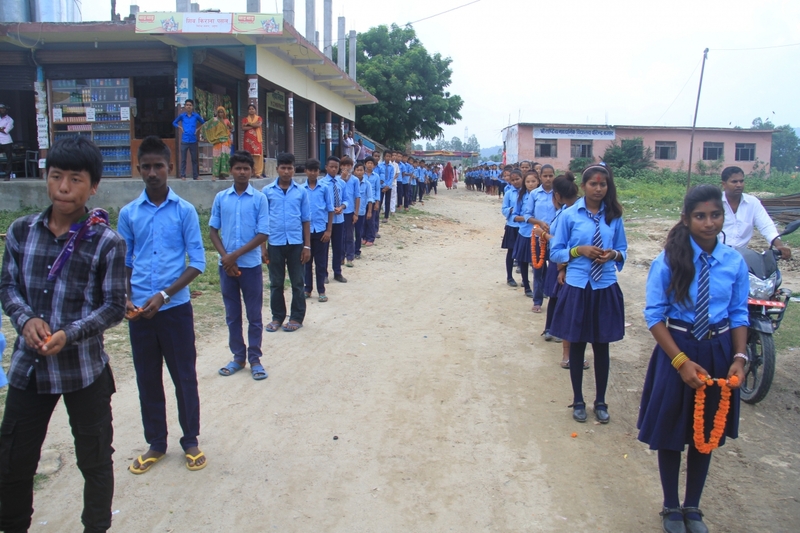 Last but not the least is the ‘Speech of Gratitude’ by Mr. Hem Bahadur Thapa, he is from School Management committee. 이 프로그램은 이 학교 교장 선생님인 히라 랄 샤의 따뜻한 환영사로 시작되었다. 주요 내빈인 에크 낫 다칼, 여성연합 회장 블레 씨 다칼, 가정연합 회장 산토시 파우델 그리고 학교 운영 위원회 헤파 바하두르 타파를 소개했다. 그 후에 기공식 장소로 이동해 행사를 진행했다. 이 후, 블레씨 타칼씨가 기공식 인사말씀을 하고 이어서 산토시 파우델씨가 특별사, 에크 낫 다칼씨가 손님대표 말씀을 했다. 마지막으로 ‘감사인사’는 학교 운영 위원회의 헤파 바하두르 타파씨가 했다. The program was attended by students, parents, and local community. Everyone is very grateful with the generous assistance and support of WFWP-Korea and Tongil group. This will remain in their hearts for lifetime existence. 이 프로그램은 학생, 부모, 지역사회가 참여 했으며,. 모든 사람들은 한국 여성연합과 통일그룹에게 지원과 지지에 감사하고 있다. 이것은 평생 동안 그들의 마음속에 남아 있을 것이다.